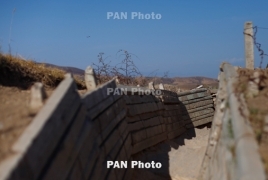 PanARMENIAN.Net - Armenia and Azerbaijan on Monday, April 15 agreed to take measures, on a mutual basis, to allow families to have access to their relatives held in custody in the two countries, according to a statement issued by the OSCE Minsk Group co-chairs. The Foreign Ministers of Russia, Azerbaijan, and Armenia – Sergey Lavrov, Elmar Mammadyarov, and Zohrab Mnatsakanyan – held a working meeting in Moscow at the initiative of the Russian side on Monday. The co-chairs of the OSCE Minsk Group (Igor Popov of the Russian Federation, Andrew Schofer of the United States of America, and Stéphane Visconti of France), as well as Personal Representative of the OSCE Chairperson-in-Office Andrzej Kasprzyk, joined the meeting. As a follow-up to the agreements reached by President Aliyev and Prime Minister Pashinyan at their summit in Vienna on March 29, the participants in the meeting discussed the situation at the border and the line of contact, as well as the prospects for establishing humanitarian co-operation. They also exchanged detailed views on key aspects of the settlement process. "The Foreign Ministers of Azerbaijan and Armenia reaffirmed the intention of the parties to continue their efforts to resolve the Nagorno-Karabakh conflict through political and diplomatic means. The Ministers emphasized their interest in the further stabilization of the situation in the conflict zone, in particular during agricultural activities. They also agreed to take measures, on a mutual basis, to allow families to have access to their relatives held in custody in the respective detention centers of the parties. The Ministers expressed their willingness to start concrete work on establishing contacts between people, including through mutual visits of media representatives," the OSCE statement said. "The Minister of Foreign Affairs of the Russian Federation and the Co-Chairs of the OSCE Minsk Group reiterated their commitment to the mediation mission aimed at achieving a sustainable peace in the region. The participants of the meeting agreed to continue their contacts in the near future."